Jason Lynch invited me to the construction site of a segmentally-constructed, cast-in-place bridge that he designed across the Sacramento River. 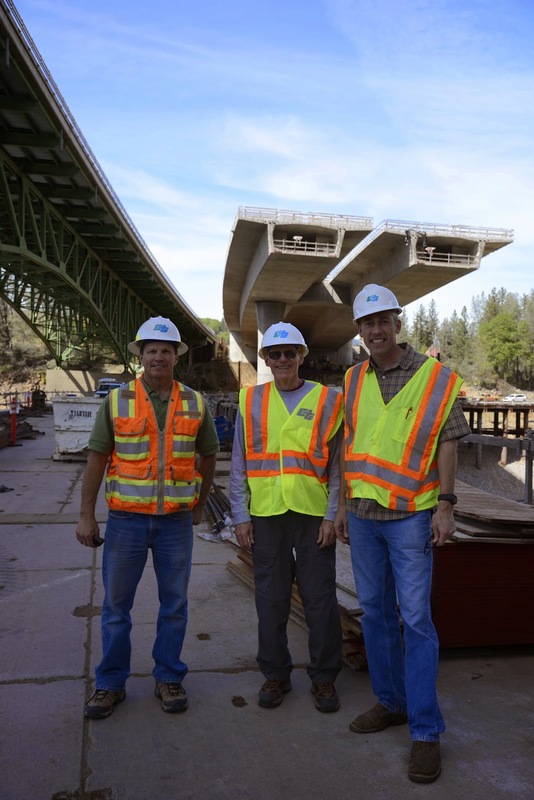 In the above photo, Jason is standing on the right and Ray Zelinski who built the first segmental bridge in California (the Pine Valley Bridge) is standing next to him. Jim Nicholls who is Caltrans Structures Rep. for the new Antlers bridge is standing next to Ray. Behind them is the existing Antlers Bridge, a 5-span continuous deck-truss bridge built in 1941 and the partially constructed new Antlers Bridge. They're standing on a trestle bridge that is being used to construct the new bridge. We'll take a closer look at the new Antlers Bridge in my next blog. Shasta County, California Bridges: Antlers Bridges (1) by Mark Yashinsky is licensed under a Creative Commons Attribution-NonCommercial-NoDerivatives 4.0 International License.